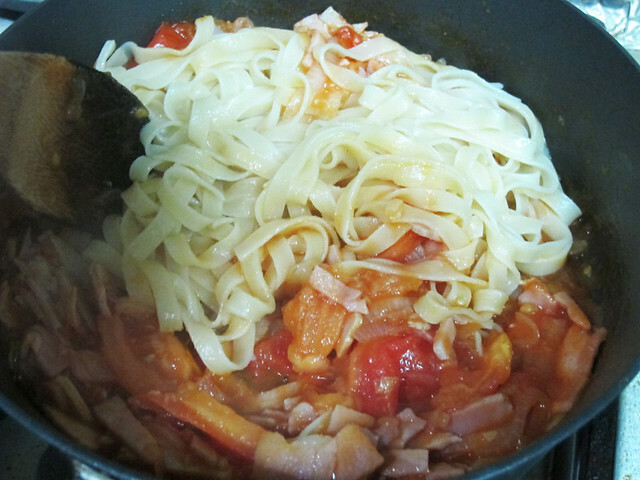 Slightly elaborate Instagram updates with a Tomato & Ham Pasta recipe. # – Take a guess. It’s a pet overall that my mom has fashioned out of a pair of old granny pants. My mom even made a hole for the tail…it is freakin’ brilliant! 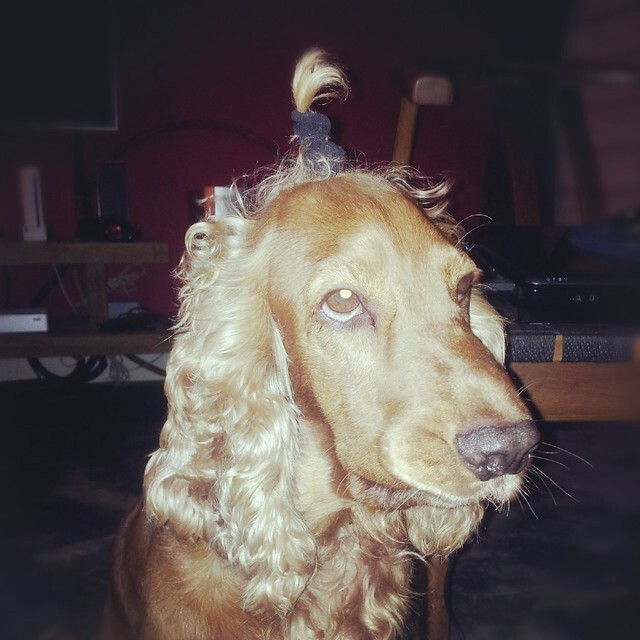 This is Charlie looking absolutely miffed because I tied his patch of hair up. # – Dude needs a groomin’. FTS, while writing this post I forgot he had a grooming appointment at 3pm today. Completely forgot about it T_T. Looks like a couple more weeks before we’ve got time to make you look more presentable, boy. My mom was a really tiny girl and according to her, the dress was loose on her. I’m just glad I could fit in it now because I remember trying it when I was 15 and it wouldn’t even zip up pass my hips!!! 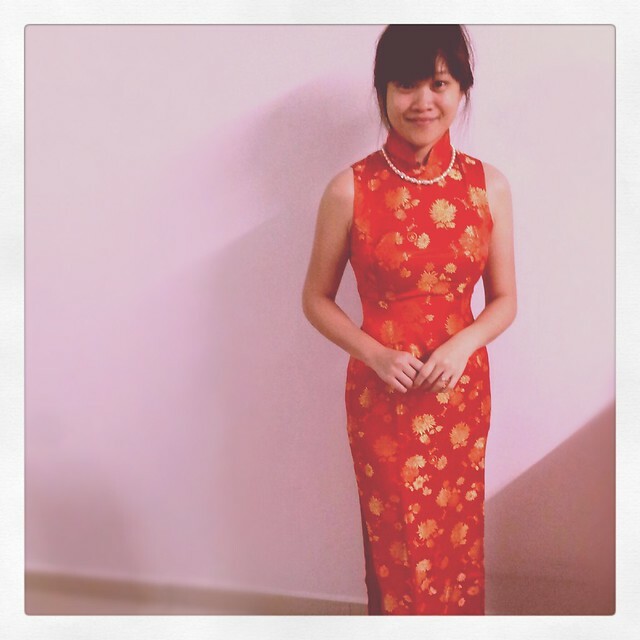 My mom has a good strategy, that I wear this while saying goodbye to guests on my reception cause I won’t be sitting down. Cause if I sat down, my belly layers will jut out. Well, thanks for the advice Mom! 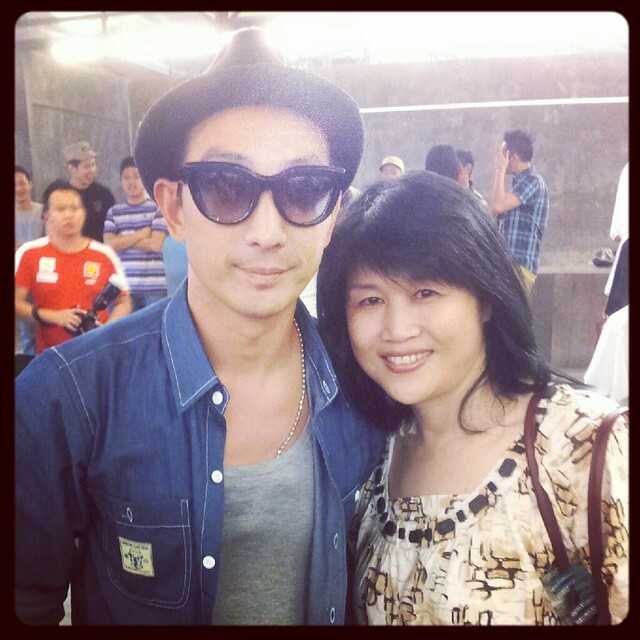 This is Mom being a total fan girl posing with Sam Lee, a HK actor. We were at Unity Store KL launch. 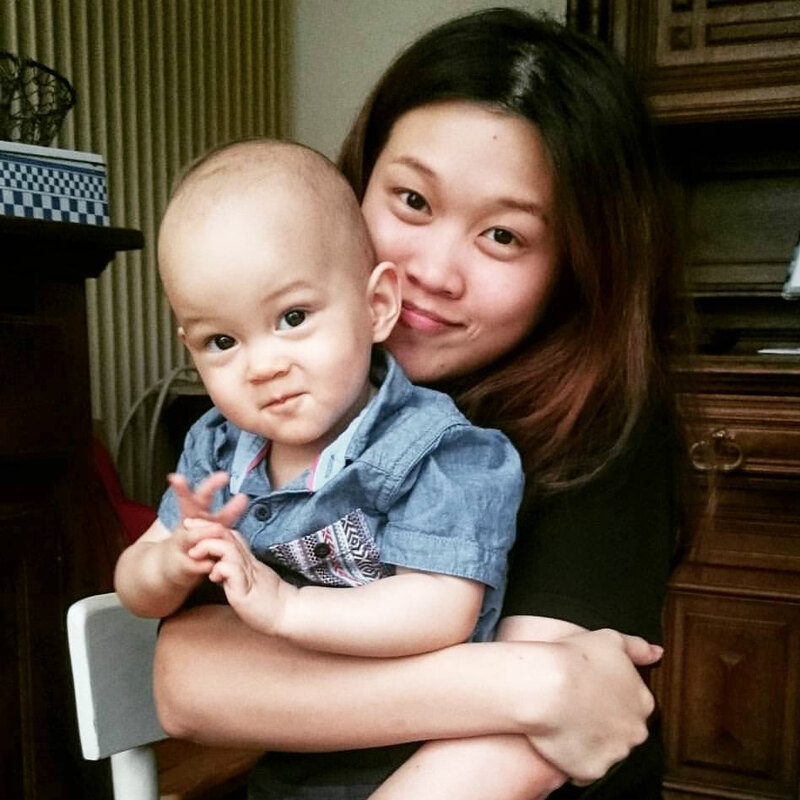 She’s currently watching a TVB show with him in it called Ghetto Justice. I think he looks a lot cuter in real life! Today’s dinner was pumpkin gnocchi with spinach & tomatoes in Chinoz BSC. One of my favourite foods and about the only vegetarian that rocks my socks off. 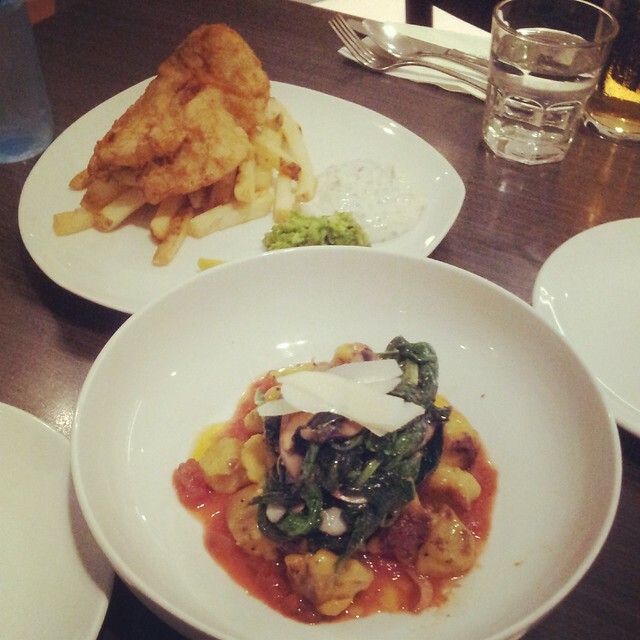 # – Top is fish & chips (ordinary) but pumpkin gnocchi below is OMGZ! Pillowy but light gnocchi with a mild pumpkin taste with blanched spinach and tomato sauce. So simple but soooooooooo gooood! 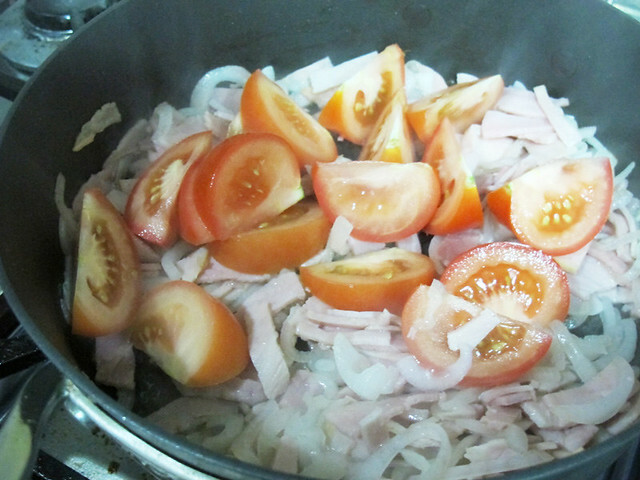 And now….recipe for my simple tomato & ham pasta. This is a truly simple recipe and doesn’t require many ingredients. Very tasty and quite healthy too! 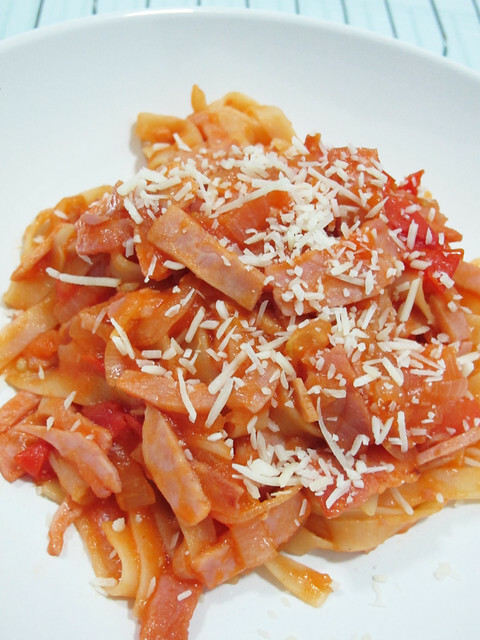 # – Simple tomato & ham pasta. 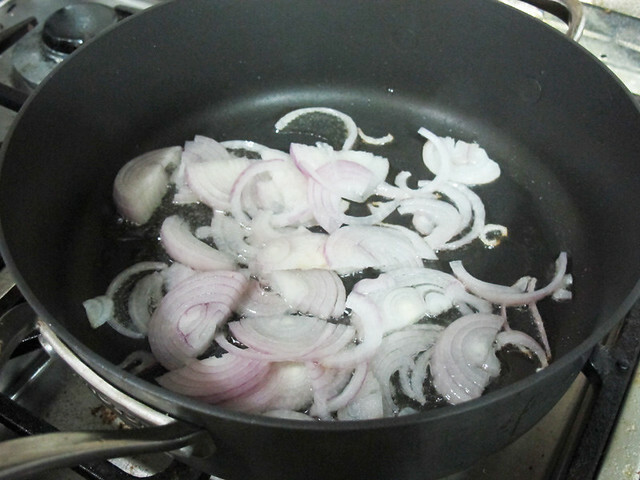 #1 – First saute the sliced onions until translucent. 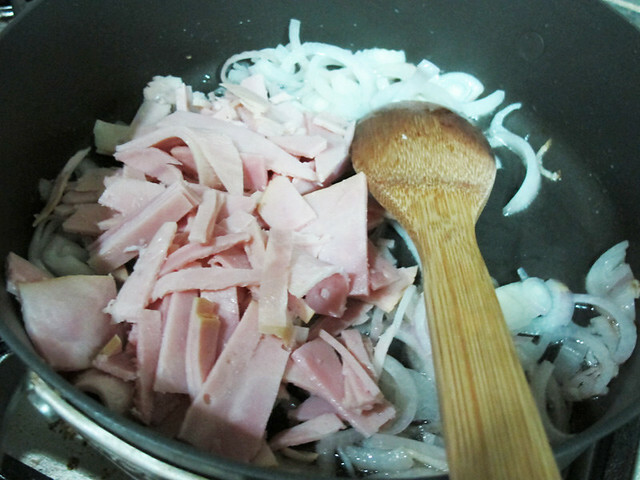 #2 – Then, throw in the ham and stir fry until slightly browned. 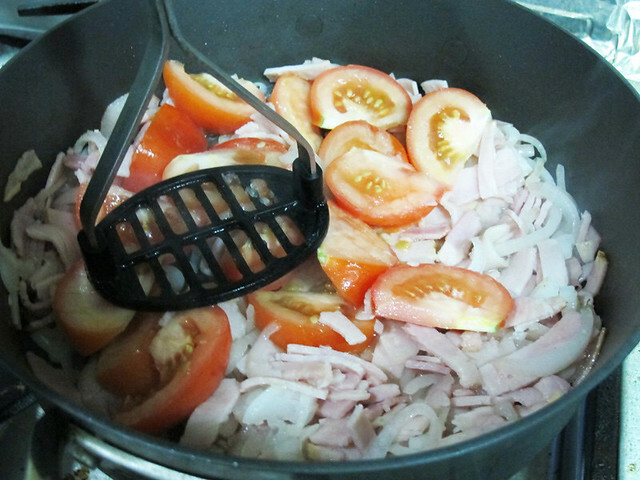 #3 – Next, throw in the quartered tomatoes. 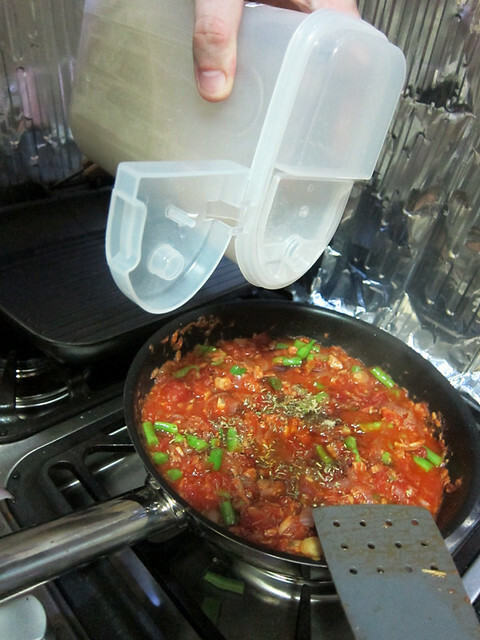 #4 – With a potato masher, squash the tomatoes till they break down. Crying. 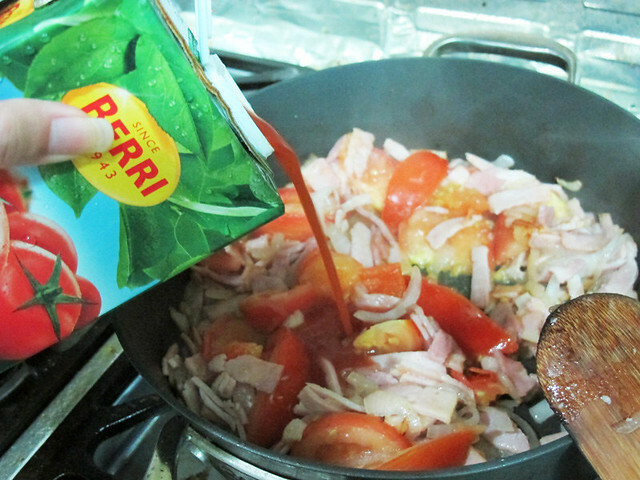 #5 – Pour in the tomato juice, little by little and stir until you get the consistency of a slightly thickened sauce. 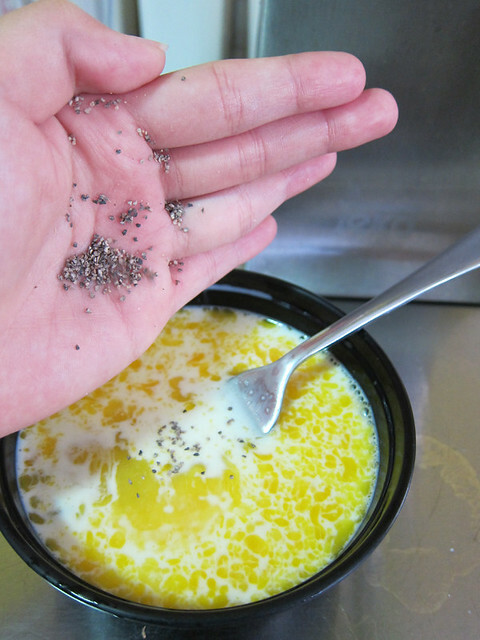 #6 – Season with salt & pepper. Remember to taste as you go as tomato juice is quite salty on its own! #7 – Dump in the cooked pasta (which you of course, was already cooking while you were making the sauce) and mix to coat evenly. 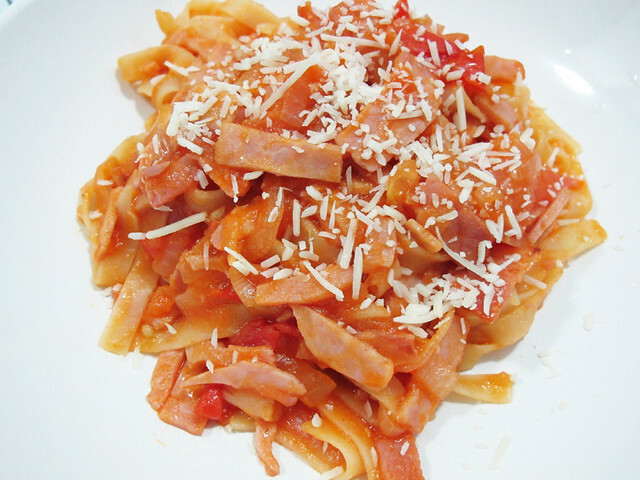 #8 – Tomato & ham pasta with a sprinkling of grated parmesan, DONE! Love this dish, I have made it several times actually. It’s quick & easy to make and really flavourful without having to use an entire can of plum tomatoes or herbs. You’d be surprised! 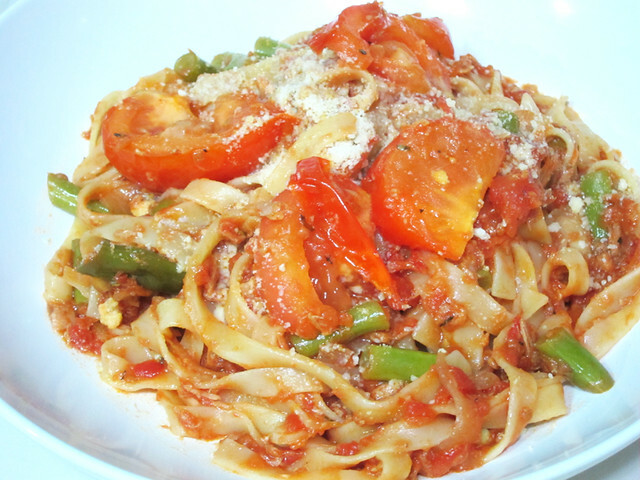 Spicy tuna and French bean tagliatelle recipe. 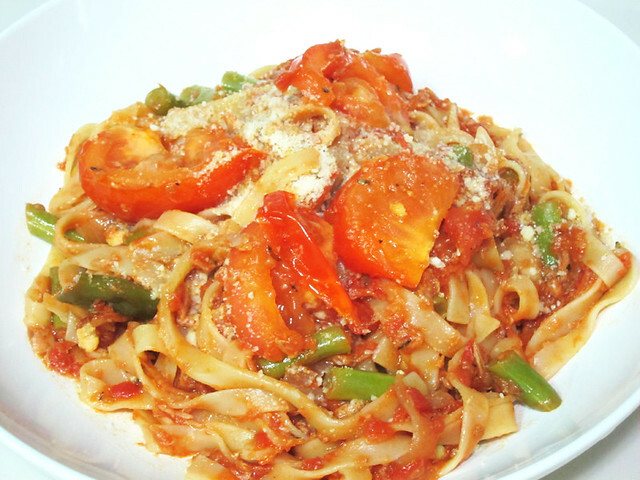 # – Spicy tuna and French bean tagliatelle. The pasta was a superb comfort food! Thanks Boobehs! Al-dente pasta coated evenly with a perfectly flavoursome sauce. Hrmmm, my mouth waters at the thought of the dish. 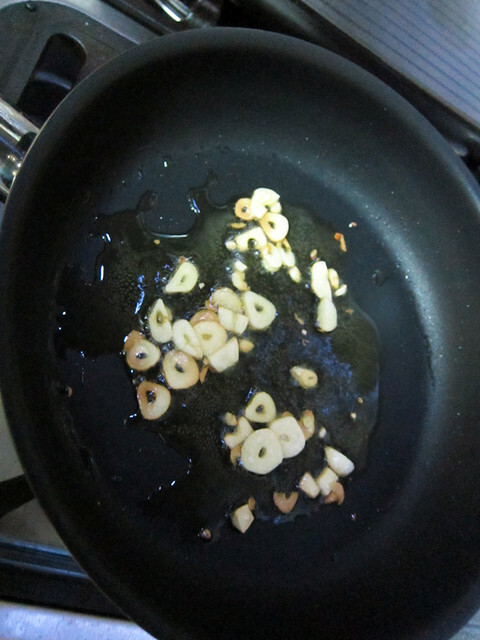 # – First, sauteed some garlic slices in a pan till fragrant. 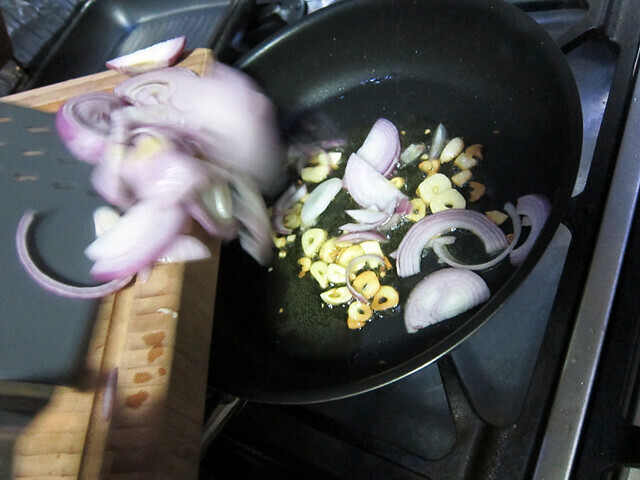 # – Then, throw in the sliced onions. 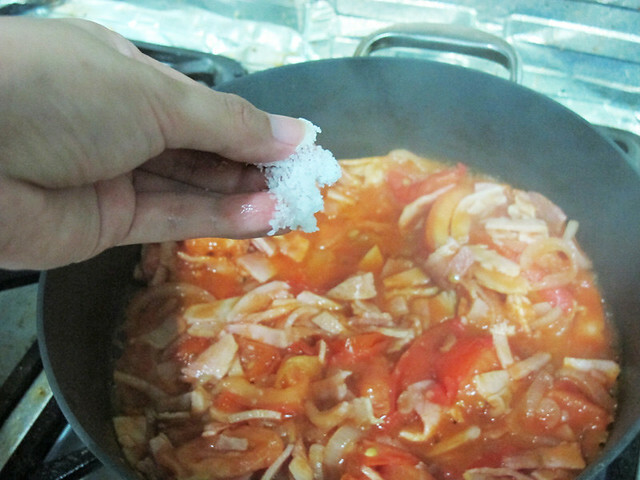 # – Followed by 3 tablespoons of tomato puree. Stir to mix. 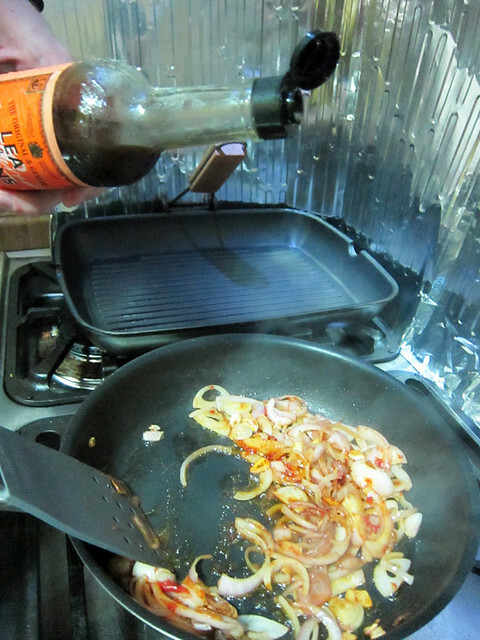 # – Don’t forget a couple of dashes of Worcestershire sauce. 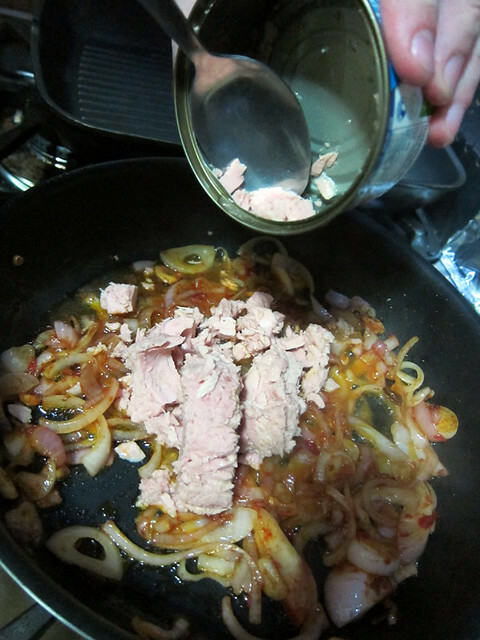 # – Now, empty a an of drained tuna chunks into the pan. 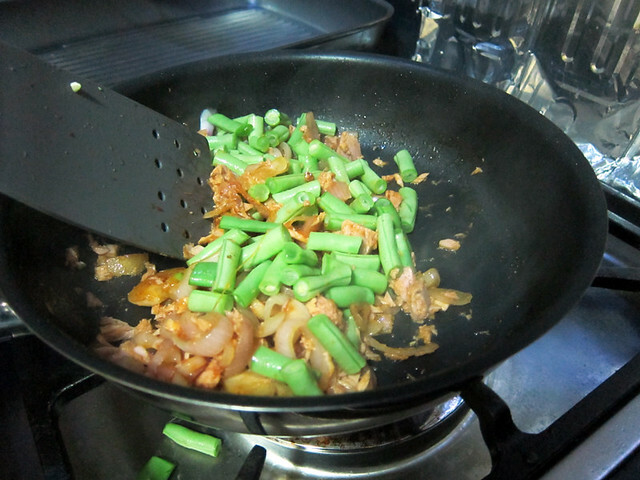 # – Then, chuck in the french beans. 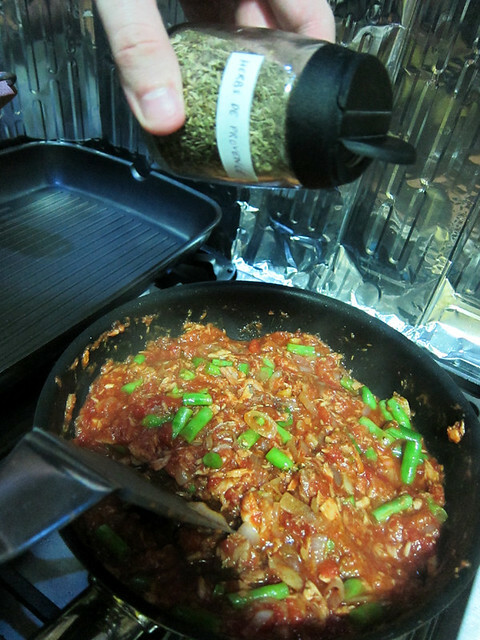 # – Some black pepper……..
# – Then, empty a can of chopped plum tomatoes. # – Season with one tablespoon of brown sugar to offset the tartness a bit. # – A few dashes of Italian Herbs or Herb de Provence for more depth of flavour. 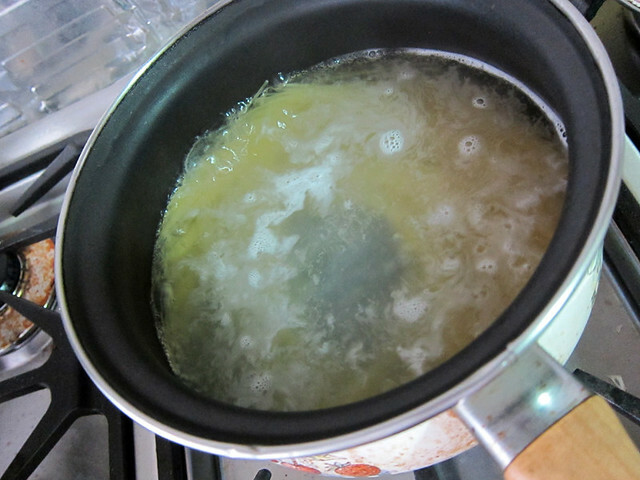 Let the mixture simmer while you cook the pasta. # – Cook the tagliatelle according to instructions on the pack. 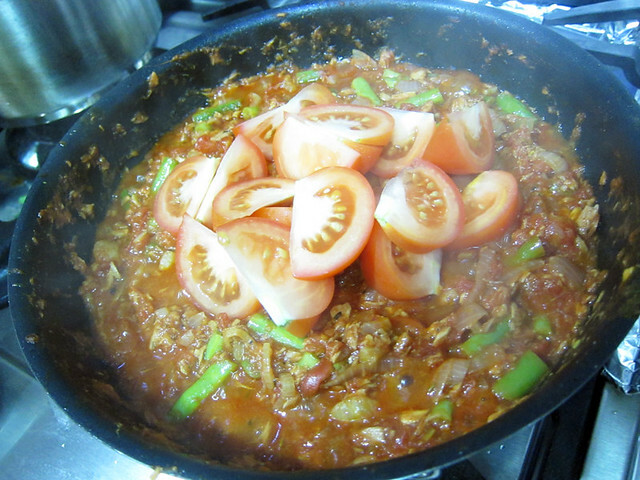 # – A minute before the pasta should finish cooking, throw in fresh tomatoes into the sauce mixture. # – Pour in the drained pasta immediately. Mix till pasta are properly coated with the sauce. 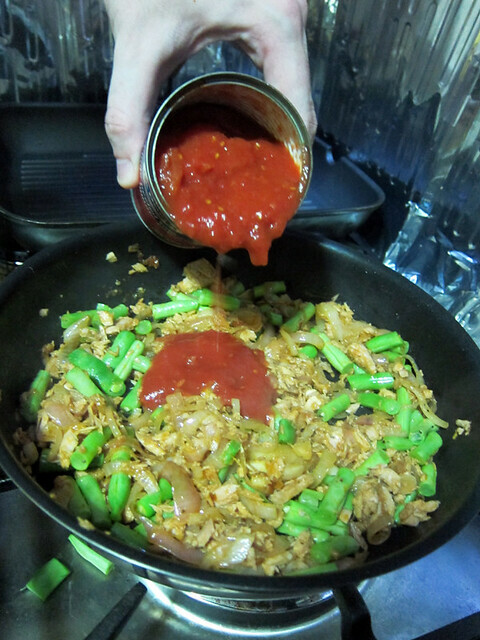 # – Spicy tuna and French bean tagliatelle, DONE! The BF really has a knack for conjuring up wonderful flavours, a skill that I have yet to master. Hopefully in the near future I’ll be able to simply throw some ingredients together and it can taste as good as this spicy tuna and French bean tagliatelle, hehe. 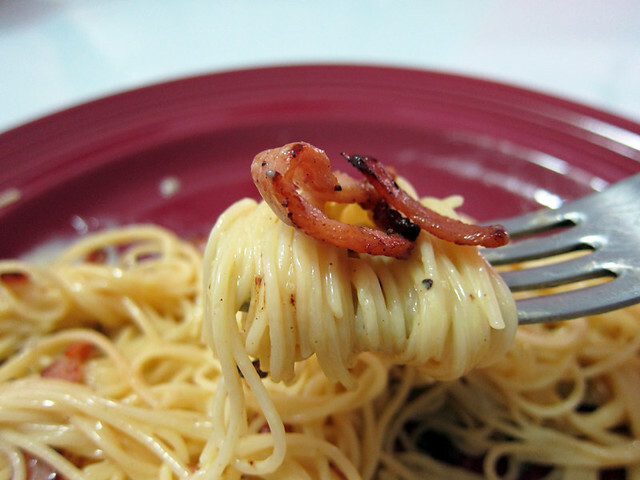 Everybody can make pasta carbonara! 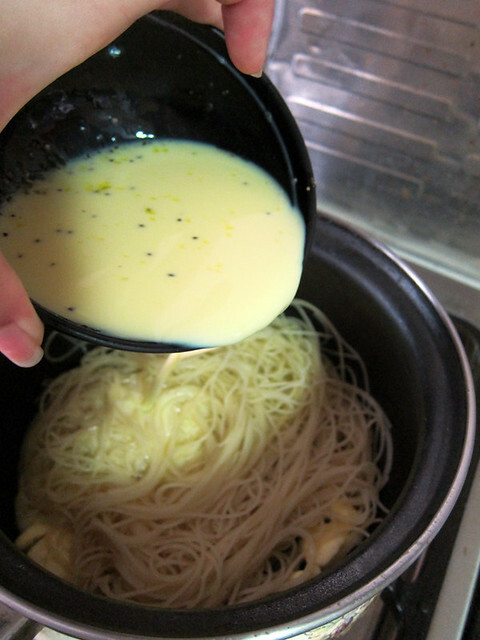 I remember my first time making pasta carbonara. Well, it ended in disaster. The pasta was overcooked to the point of clumping. 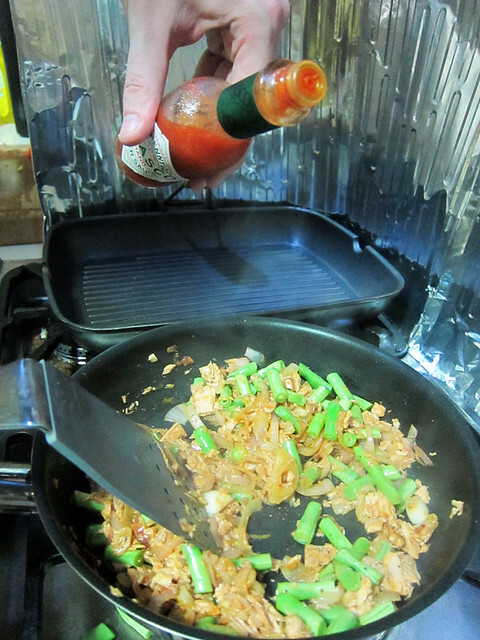 The sauce was gloopy (I made it with corn starch….cue /screams of horror). The bacons were cremated. Yeap, it was that bad. 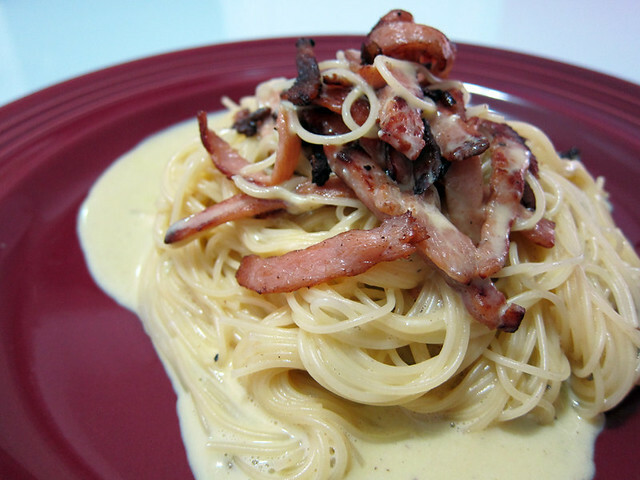 # – Creamy, porky, bacon carbonara pasta! 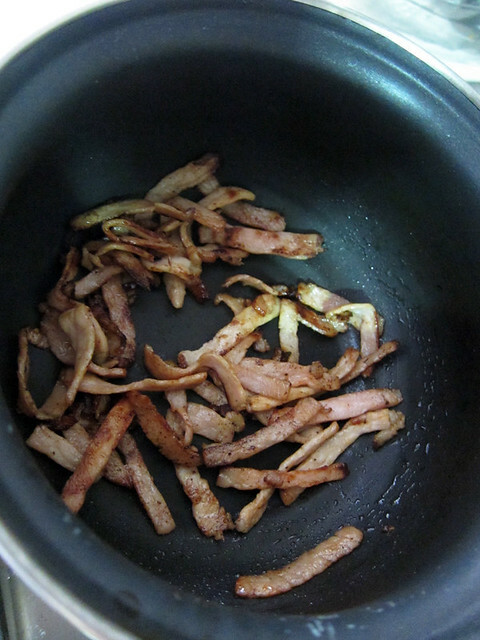 # – On medium flame, dump the bacon strips into a pan to brown. There’s no need for additional oil as the bacon will produce its own grease. Stir around occasionally. # – After about 10 minutes, they will look like this. Turn off the flame and set aside. 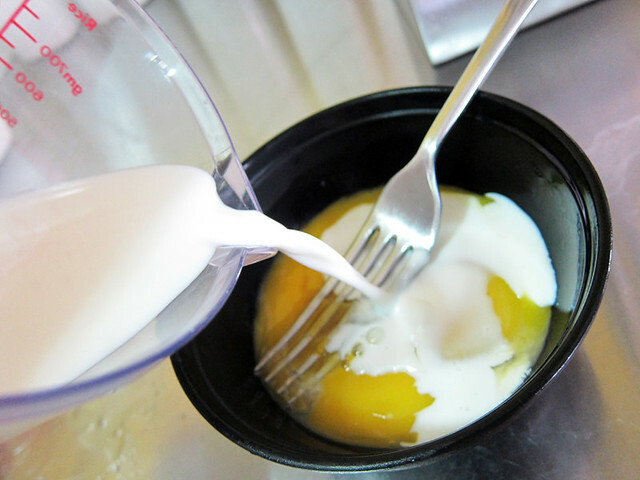 # – Now in a bowl, pour the milk into 4 egg yolks. 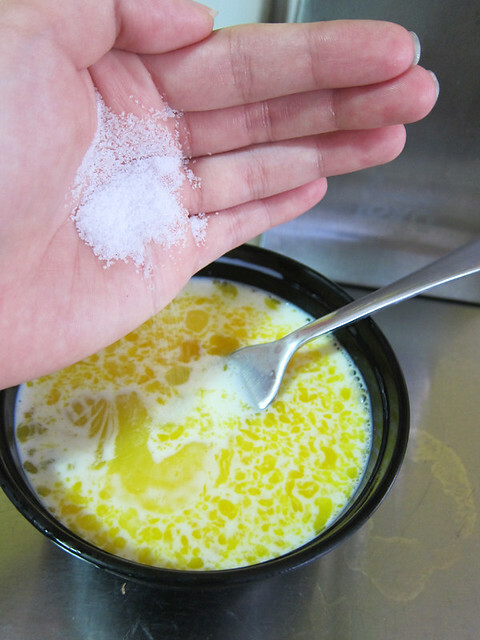 # – Add 3/4 tablespoon of salt. 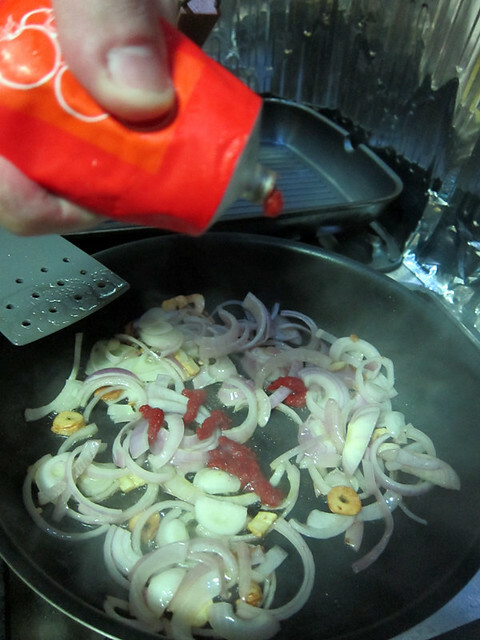 # – Followed by a dash of black pepper. 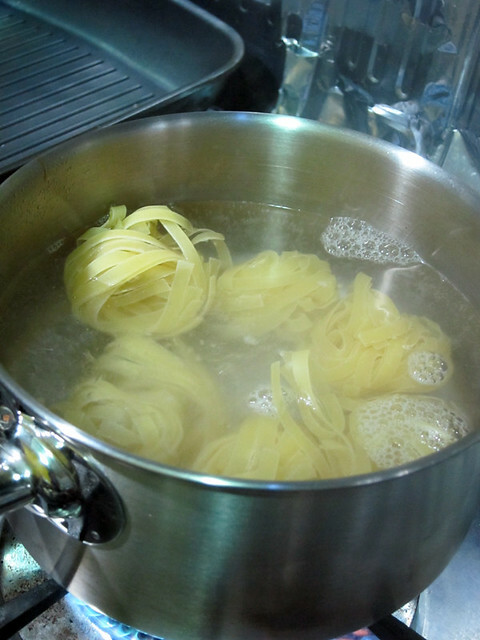 # – Now cook the pasta according to instructions on its packet. 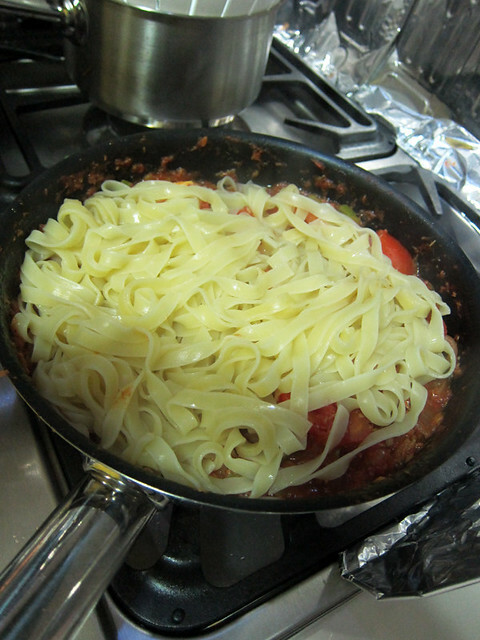 # – Then drain the pasta and put it back into the pot it was cooked in. Add two dollops of butter. 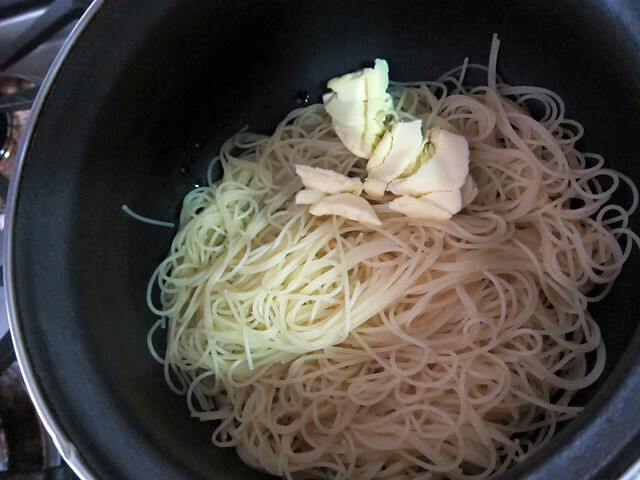 # – And now, pour in the eggy mixture into the pasta. 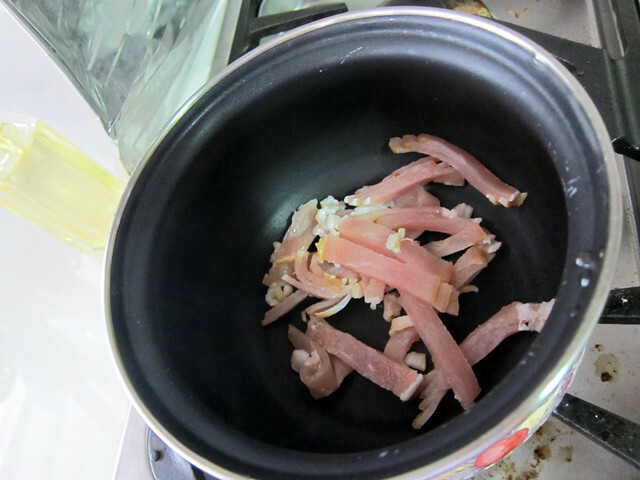 # – Dump 3/4 of the cooked bacon strips into the pasta. 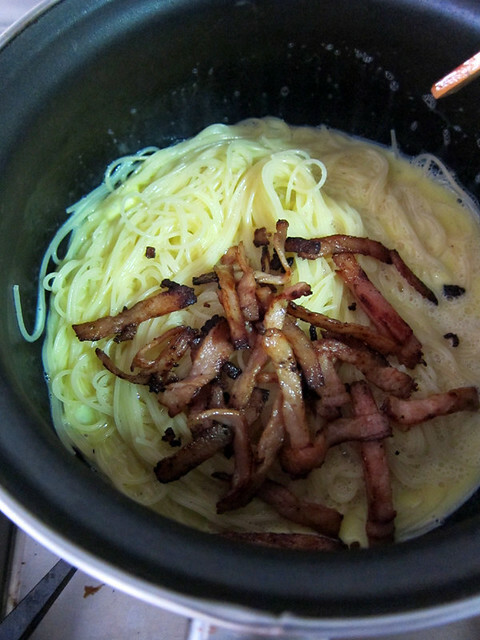 Stir till pasta, bacon and the carbonara sauce are well mixed. 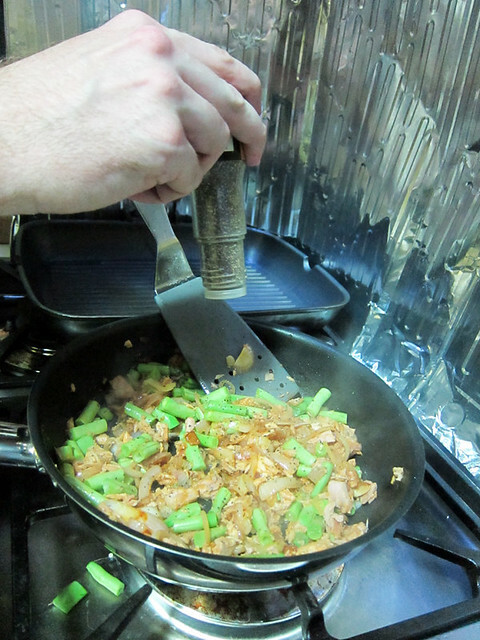 If you find the sauce a bit too watery for your taste, you could actually put the pan on low heat and stir till the sauce looks a bit reduced and thicker…be observant though as you don’t want dry carbonara pasta. Dry carbonara pasta is nasty, trust me I know! 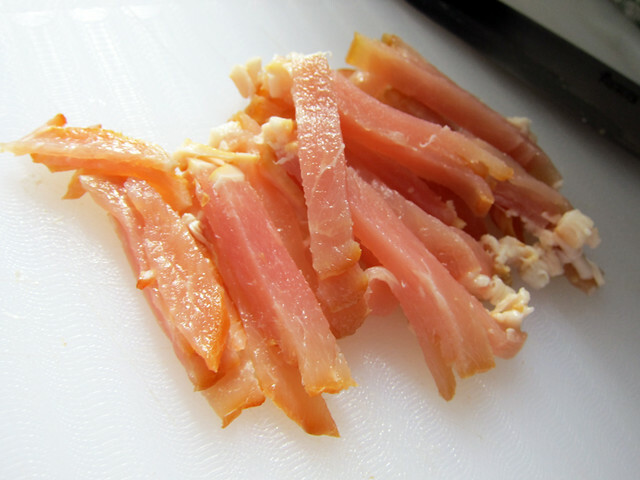 # – Plate it and garnish with the leftover bacon strips. # – Simple, delicious, comforting pasta carbonara, DONE! 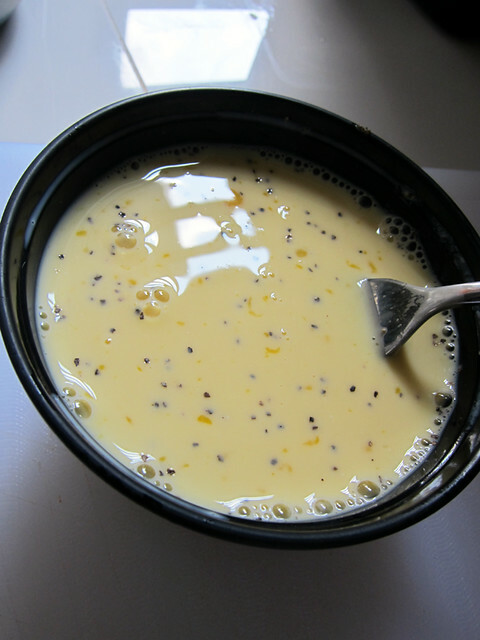 This is also a great recipe when you’ve got a surplus of egg yolks. I make meringues once a week so I’ve got a lot of egg yolks lying around waiting to be turned into yumminess.